HAMDEN, Connecticut — The first day of the No. 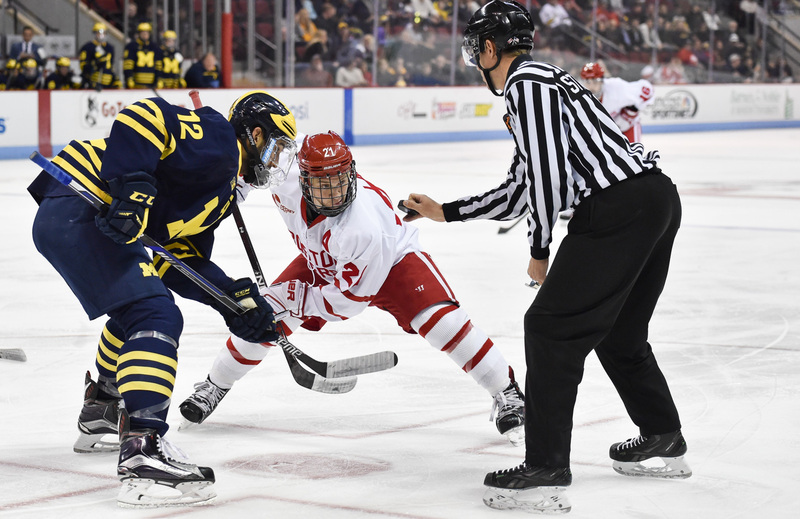 12 Boston University men’s hockey team’s road trip was, in a word, disappointing. A one-goal loss at the hands of No. 15 Yale University to start the weekend set up an even tougher test on Saturday against undefeated No. 2 Quinnipiac University. Having to play a top-five opponent is tough on any day of the week, but playing with a short bench and without two top defensemen makes life even more of a challenge. Not exactly a winning recipe for most teams. But head coach David Quinn remained positive. For the last season-and-a-half, his team has lost two games in a row exactly one time. So, to him, even when the Terriers were down a goal early in the first period, a rebound was more than possible. It was almost inevitable. The Terriers (9-6-3, 4-3-2 Hockey East) did get back on the right track, beating Quinnipiac (15-1-2), 4-1, at High Point Solutions Arena. Despite the Bobcats jumping in front early, the Terriers scored four unanswered goals from senior assistant captain Matt Lane, junior forward Robbie Baillargeon and freshman center Bobo Carpenter. Quinnipiac’s season-opening 17-game unbeaten streak came to an end, while BU has now won two of its last three games. It wasn’t just that Terriers responded to a loss that made Quinn happy, but it was the way that it was done that truly pleased him. Lane, who finished the night with two goals, said the win was a two-fold positive. Beating a team of QU’s stature was a big enough accomplishment, and it’s one the Terriers will relish for the next month or so until they get back on the ice for another game after a 26-day layoff. It wasn’t as if it was smooth sailing early for BU, though. The Bobcats got on the board in a hurry in the first period with top goal scorer, forward Sam Anas. While on the rush, forward Landon Smith skated up the left wall, and found Anas in the center of the slot with a lot of space. Anas deked around junior defenseman Doyle Somerby and beat senior netminder Sean Maguire high with a backhander. It was a slog early for the Terriers, who had trouble getting their legs under them early. But from there, BU took over. At the 14:42 mark, BU’s efforts paid off when Lane scored his seventh goal of the year. Freshman forward Jordan Greenway set a play up from behind the QU net and found Lane in the low slot. The senior ended the play with a one-timer that got past goaltender Michael Garteig up high. The assist for Greenway was his sixth point in five games. Greenway wasn’t the only one that proved difficult in coverage for QU, as Baillargeon’s physical skating also ended up being a handful for the Bobcats. Five seconds after a Lane hooking penalty expired early in the second period, Baillargeon carried the puck into the offensive zone, drove wide along the left wing and used a low backhanded shot to fool Garteig on the short side for his third goal of the year. A late power play, courtesy of a penalty from sophomore forward A.J. Greer, gave the Bobcats a late chance in the middle frame, but Maguire stood tall. Maguire again came through in the third period, when QU had two man-advantage chances with under 10 minutes to go in the game. He made all the necessary saves, and preserved the BU lead. For the night, Maguire totaled 36 saves on 37 shots. Garteig, for his part, stopped 24 chances. While Maguire did his part, so did Carpenter and the offense, which came up with timely plays. Carpenter missed on one chance down low, but Baillargeon picked up the rebound, fed it to him at the right circle and Carpenter shot it high into the far corner of the goal with 12:31 remaining in the third. After BU killed off the penalties in final minutes, Lane added his second goal of the game with an empty-netter in the final seconds. But in spite of all the good feelings BU had, there was a scary moment added to the mix early in the third period. Already exhausting its healthy scratches over the weekend, the Terriers appeared to be dealt a blow when senior winger Ahti Oksanen went crashing into the end boards after a partial breakaway attempt. Oksanen clutched his right arm while being assisted off the ice by BU’s training staff. Quinn said after the game that it was to soon to know the severity of the injury. Quinn wanted to keep the focus on what the Terriers achieved. He said they’re not at the top the standings, but that’s not what it’s all about, at least at this time of the year. “A great way to end the break,” Quinn said. “Is our record what we want it to be? No, it’s not, but our makeup is.